Sold In Pairs Only. NOT ELIGIBLE FOR FREE SHIPPING. 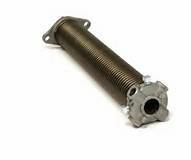 Most Garage Door Manufacturers supply springs rated at 10,000 cycles. The average life of a garage door spring varies based on the number times the garage door cycles(opens and closes. )Daily usage of 1 to 3 times a day, would have an average spring life of approximately 7 to 10 years. Increased cycles, and temperature changes as well as low grade imported spring wire, will reduce the average spring life by 50%.These variables will cause the spring wire to crystalize and snap at the weakest point. If you have a 2 spring system, it is best to replace both springs to avoid having to repeat the replacement cost and labor.